I am not an intellectual but I love to read. I am not an artist but I can appreciate art in many forms but mostly I am not a scientist where proving the validity of a myth becomes critical. Myth and lies are not synonymous. No one has to convince me that stories which are told over and over and believed to be true are true! Perhaps their original meaning was lost and perhaps not. What is to be gained from the story is the essence. If women were always under dogs in this world of ours there would have been no need to systematically destroy their credibility over the last five thousand years. The mysteries of women will always frighten. Our power to nurture life, in particular, is still as unfathomable to men and often to ourselves, as any other mystery. models. Mythology has many stories of women in power, women deities, and warrior women who fought for human rights. We know that our ancestors paid homage to the great mother. Earth was seen as nurturing and life giving. Life cycles were normal, connected to the moon, easily explainable in the context of daily life.The first menses was celebrated and understood. Women learned to move in a natural cycle. When did these events become unclean and dirty? Conception, childbirth and child-rearing were carried on within the love and support of a community. Life may have been a struggle but it was a shared endeavour. Nothing much has changed! We may control much of our life today but we still need to honour and appreciate ourselves. No one needs to tell me that women had a different life before history was written. We were there, in the cells of our mothers and grandmothers that have been handed down to us. In the context of history and time, we stumbled but found a way to right ourselves and now we will walk tall again. As I read the literature that is written by many western – born authors, and read by women who struggle with understanding their history (or herstory), I am amazed at how simple it was for me to believe in a natural and enduring feminine courage and strength. Intuitively, I knew that despite an unproven and undocumented time in our distant past, women and their mysteries were the main thread in the fabric of life. Mother’s Day Talk Orillia Star of Hope Spiritualist Church. I want to wish all of you many blessings for a Happy Mothers Day! Today we are here to celebrate lives, heal breaches, and renew commitments to our mothers and one another. My grandmother came to this country in 1927. She made the wrenching decision to leave her young son to be raised by his father. She was looking for an opportunity to make better life for herself and her large extended family. It was twelve years before she was reunited with her son. It was nearly eight more years before she was able to bring him and his wife, my mother, and two children to Canada. I was one of those two children, little more than a baby. The lives we lived as a family helped to shape my character. The multicultural community in which I was raised helped to inform and shape my knowledge of life. I have believed, for as long as I can remember that my destiny was set in motion, before I was born. What I learned from my Grandmother was that nothing was impossible. How much effort I put into anything would yield results equal to the effort. Sage advice, which I have understood and acted on. I started my working life by travelling to England to study nursing. Four years later, Diploma in one hand and a new husband in the other, we moved to Jamaica, the land of my birth, for seven years. In 1976, we returned home with our two children and I settled into the rigors of being a wife, mother and career person. If you ask me what was most important to me personally, it was to experience and to challenge myself about anything and everything then put my learning to work. As a mother I wanted to pass on those same values to my children and grandchildren. In the culture of my family, getting an education first, was considered the best opportunity to start building a good life. Thanks to that instilled value from my parents and grandparents, I have enjoyed many career opportunities and I have loved every one of them. Nursing is still my primary job and fills my heart every day. Nursing has paved the way for me to be in touch with people from all over the world and hear stories which inspire me. I sincerely believe that human contact feeds the spirit. My work as an Interfaith Minister has taught me how to draw people together to share ritual service in joy and in sorrow. This is a powerful and meaningful way to raise the energy of humanity to spiritual levels. But today, I am here to share in the joy and celebration of these three words, Mother as a person, Mothering as an art and Mothered as a gift. I must say that this was a particularly difficult topic for me, despite growing up with my mother, and a grandmother close by. I have also worked for 35 years with mothers and babies in birthing. I have seen this art of mothering from many different perspectives. At the core of mother’s day is The Mother and since mine has passed away, I have moved to place where peace of mind over her loss, first to Alzheimer’s, then transition, comes from celebrating the act of mothering and appreciating what that means. All the words I said in my introduction are especially important this year. I will be celebrating the 50th anniversary of my travel to England to begin my nursing career. I remember in July of 1966, leaving my parents, siblings, grandparents and friends to get on a plane and travel thousands of miles from everything I had ever known to pursue a dream. The reason why I was able to do that with an open mind and heart was because of my mother. In this day and age, a working mother is the norm but in my childhood, during the 1950’s it was different. Almost all of my peers had stay-at-home mothers. I went to their houses after school and there was Mama in the kitchen. After school snack were prepared and given with a loving hug. I might have been resentful but I thought my mom was pretty special. My mother was a role model for me and my sister. It took some years for me to understand what that meant but as I look back now on the day when I got on that plane in my high heels and business-like suit, I can thank my mother for opening my eyes to other possibilities beyond, marriage and children. Please don’t think that career role modelling was the only gift I got from my mother. I was also mothered. She washed and styled my hair. My sister and I were dressed alike for parties even though there was a four year difference in our ages. She diagnosed and gave me medicine when I was sick, listened and provided advice, protected me from harm, taught me right from wrong, gave me skills to manage my money, made sure I could cook a decent meal. We had to do laundry and help keep the house clean. My mother arranged for me to learn to play music, sing hymns in church, perform in public and feel no fear whether I helped the poorest or the richest and anyone in between. Both of my parents were also social activists and taught me the responsibility of being a good citizen. Watching with my little girls eyes as my mother went back to school as an adult, gave me the courage to do the same. When I think back on all of those amazing skills she taught me, I realized that to some extent mothers and mothering were the forerunner of all these careers. Mothers taught everything! Banking, cooking, cleaning, nursing, teaching, protection, civil duties…. All of the person to person jobs in the world must have evolved from the ancient role of mother. That was an eye opener for me and yet another opportunity to appreciate the art of mothering. When I imagine that my mother was born just thirteen years into the last century, when women were still wearing ankle length dresses, hats and gloves, it is amazing that she could have been so forward thinking. Even more so, when you consider that she was a late baby, second last of ten. Her own mother, my maternal grandmother was born in 1872. So her push for a career, set against the backdrop of her times was remarkable. I have shared my story with you, not to diminish or make comparisons to other stories of wonderful mothers whose children have made them just as proud as my mother was of me. As we celebrate this day, I would ask each of you to think back on your years and see something which you never noted before. Something that made your mother a standout, or just a list of all the things she did to keep you safe and happy and share it. Even in challenging households, and I have seen many in the course of my career, there was something to be gained from the experience. Many children have been forced to grow up before their time because the mother is physically or emotionally unavailable. And while this may have been harsh, many learned to be self-sufficient at a very early age, taking care of other siblings, and the home. I have heard these stories over and over. But what I have also seen is that these children, now adults, who may look back in sorrow and regret, or even anger, they have learned how to cherish, love and heal their inner child so that they may feel mothered. While I offer praise and thanks for the wonderful role of mothers, I realize it begs the question, which isn’t really a question, but the words ‘what about’ come to mind. This invites an inevitable comparison. Indeed we must honour and praise women who are biological mothers but what about those wonderful women who cannot give birth, who help out as the unmarried aunt, or those who adopt or foster children? They also deserve our respect and admiration. And, what about those women who are unable to give birth or adopt but choose to nurture an idea into fruition, build, create, or support projects in communities. In many ways they are also mothering. Last but not least, I also want to pay homage to those career people who spend periods of time mothering our children, our family and friends. Teachers, child care and personal support workers, nurses, doctors, lawyers, police: These are all careers which I believe, have evolved out of mothering. In each person there is the capacity to give a little of ourselves to another and take on the role of mothering for a time. We thank them and honour them too. Over the weekend of October 1-2 2011, the second of my firsts came to fruition. Imagine at my great young middle age, having the opportunity to participate in something new, something never done before with an amazing group of people I never met and doing it for the second time in less than three months! I thought my time in Hollywood was awesome but my ordination as an interfaith minister was as challenging as it gets. Although I had been ordained in 1999 through The International Assembly of Spiritual Healers and Earth Stewards, I didn’t take my divinity degree until 2002-4, when I realized a dream to build a new and unique Ministry for and by women. The additional training added a wonderful dimension to the work. The whole plan started to blossom in 2004 only to have it shattered with the sudden and unexpected death of my co-collaborator, dear friend and business partner. Everything was put on hold. For the first three years I was shattered, feeling that perhaps it wasn’t meant to be. Then one day, I woke up, like Buddha and wondered why I thought all the dreams we shared as friends should end. Some dreams die with people who share our goals, some have to be adjusted and some should go on in order to honour the person and keep their spirit alive. This dream we had of helping women and men to overcome trauma and childhood abuse was worthy and needed. Our vision was not for ourselves but for how we could help others. So I started on projects which clearly got me back on the right track. I completed and published my two novels, The Will To Be True/In The Shadow of the Blackbird and a third, Suspect, Love. Just as I completed my third book and pitched it at the first ever ‘Pitchfest’ organized by my publisher in Hollywood, I was offered a chance to be ordained with the seminary, AIHT, where I completed my degree, something which was not available at the time I graduated. How do they connect? The novels relate stories of strong women who have overcome childhood traumas and succeeded where they thought the status quo was the only option. On completing the books and having them published, I was inspired to follow my global paths and fulfill those dormant dreams. Getting to the point of ordination was not easy. We were given three months to complete herculean tasks (well it seemed that way to me). With much focus, I finished the required courses, books, and services. ( I mean, who needed to write another 10,000 word essay after writing a 100,00 word book?). I mailed my last assignment two days before the deadline and blamed Canada Post for not getting it there on time. I wasn’t the only one but the College faculty were beyond understanding and so patient with all of us because this whole ordination things was new for them too. Our group was just amazing. We were from all walks of life, sharing different histories, but working with common purpose to prepare for our ordination and bring our strengths to the multi-faith service in which we all took part. I never met any of my colleagues but knew most of them by voice. With very few hitches, we were all ordained by the hardworking Administrative Director and Director of the College through the support of A World Alliance of Interfaith Clergy. Change and challenge are always wonderful exercises which allow us to observe the strength of the human spirit. As humans we are blessed with the ability to look back at where we started and see where we reach, then use that impetus to move us forward. What will always please me is the chance I had to be first again and pave the way for others. I am mindful that in these later years of my life I must follow the example and goals, set as a standard for achievement, by my pioneering grandmother way back in 1927. If I emulate her courage even for a day, I hope I have made her proud of me. Some years ago, when I was buying everything that I could see, but not really understanding why I would ‘need’ a particular object, I found that over the years the knick-knacks, which I purchased or found in different corners of this wonderful country of ours, have become very useful as I’ve grown older. Many objects that I purchased on faith, have justified my faith. I realize that part of what I needed to do was to put together or synthesize my trinket world and my concrete world in a way that made sense. After much internal struggle this past year, I was able to finally recreate a little sanctuary to replace the space that I had in Singhampton. Above all, I did not want to lose the energy which helped to build that original space nor a vision of the benefit of a having a small quiet corner in the midst of a busy world. Rediscovering objects that I saved over the years has enabled me to look at life and look at what look at what I can now make useful, not just to myself but also to others who utilize @womenzpace now open at Discover the Path. 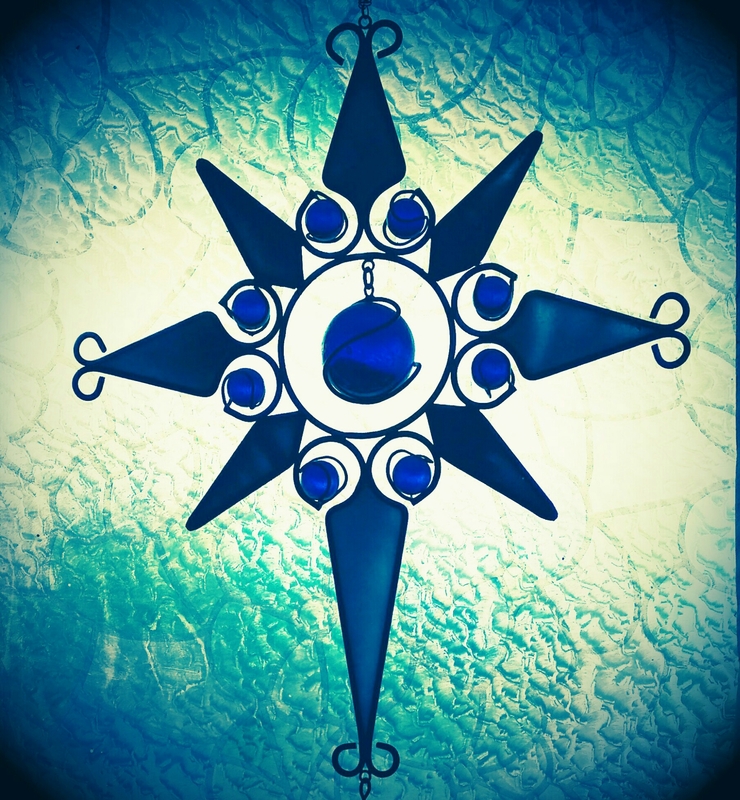 The compass, which hangs in the window, is fashioned from metal and stained-glass. It serves as a reminder to me every single day that life is full of points of light and dark, soft and sharp. All of these things meld together to create our own guideposts to choosing paths for living life when we hit the inevitable crossroads. However, the compass is so much more than points. Attention to its non verbal message helped me to realize that I could add some non specific cues for each of the sixteen points and to this end, I have started working on a draft of the way in which I hope our visitors, meditators and healers will find a helpful resource, which can be individualized, in the search for balance. We all have a spiritual compass. Our great difficulty is determining how that spiritual compass can be utilized to make our lives better. The complexity of a compass should provide an understanding of the self within the self and how each aspect of the self can serve the other. A compass, like so many other tools or events in the daily life, can point or drag you in many directions. Life is circular and while we may sometimes feel that we are walking in a straight line through an endless desert, truth is that we will wander out of it, encounter an oasis of peace and beauty before entering yet another period of desolation. It’s always a circular path. That give us hope, which is heartening, because we know there is change ahead. A wheel/circle has 360 points on it and each of those points can certainly impact your life in some way. Moving degree to degree won’t necessarily make you feel like you have exited a prescribed route, but when you look back from time to time, you will see where you have been, what you have experienced and know that there is a future which is different. In my mind, there is a great need to create some grouping. It has been done with Astrology for millennia. Personally, I created groups or sections in the compass in which I can identify tools or find cues in the visual circle of our life which will will help us to utilize the best of a particular grouping by choosing from a portfolio of elements, senses, and energies. Our goal is to help the individual realize all that nature has to offer in terms of foundation, color, feeling, sensation, sight and sound needed to support health and well-being every day. Moving forward, we are looking at this spiritual compass as a template for our present and our future and we offer anyone interested a chance to frame their own compass in ways which are meaningful to them. One of the things I remember as a child growing up was the occasions when my mother and grandmother would dress up in immaculate white dresses and caps and attend what seemed to me to be secret meetings. I knew the name was The Household of Ruth and the women did wonderful things in the community and the churches. I didn’t think much about it then but as I look back I remember that I was impressed, even as a child by the bearing of the women, their dedication to a cause and their work in tandem with the men who had a similar role in the community. I hadn’t given it much thought over the years but every February during Black History Month, I take out the old albums and review memories. Because my parents took prolific pictures there was always lots to look at. Mostly I just like to remember stories which my grandparents and parents would share with us but as time has passed and throwback Thursdays are becoming more and more popular, I thought I would do a little of both this year. One of the first pictures I found was an older photo taken perhaps in the late ’50’s or early ’60’s. With internet accessibility, I was able to find out a little more about the Household of Ruth and the Grand Order of Odd Fellows. 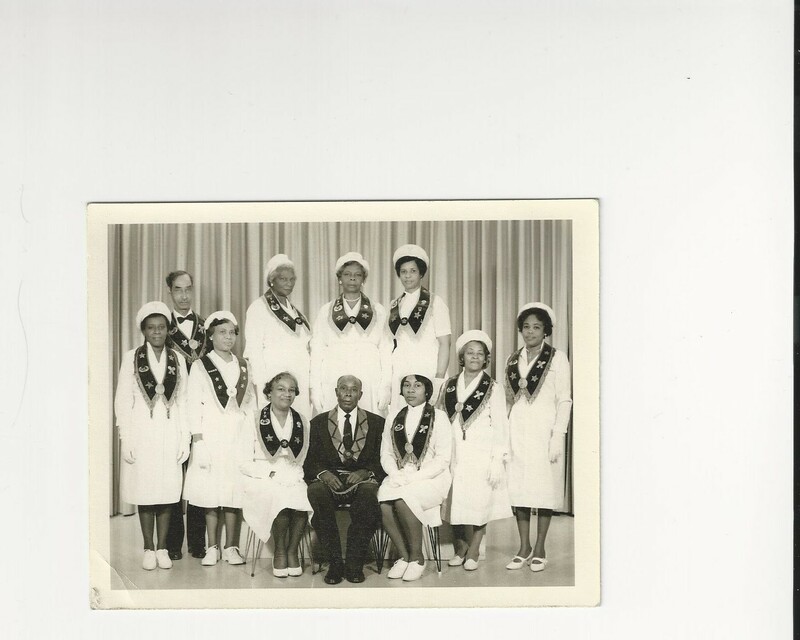 Both my grandmother and mother appear in this picture. I hope it will bring back some memories for others as well. More information about the two organizations can be found at http://guoofamerica.com/oddfellows_natl/Household_Of_Ruth.html.